Since I'm trying to get back into the groove of drawing a bit more everyday, I thought why not make some other people happy with it too and open up some sketch requests. I mostly doodle on paper and do portraits, examples given a bit further below. I probably won't have the time to take each and every request immediately, so it might also take some time until I get to yours. Now comes the sketchy (hahah, get it, because- I'll find my way out.) part. I won't ask for any faves or likes in return, however, I ask of you to do something nice for a fellow user today! 'tis the time of being positive and supportive of each other, fellow citizens. Also don't be afraid to ask for another request if you already got one and see some open spots! If you like the sketch you got, I'd be happy to make another for you. Also there is no need to ping me in this thread, I get notifications for it whenever someone posts! Please note that I might not draw every sketch the same and that some might be more / less than others, it entirely depends on my current mood and time frame. That does by no means say that I didn't like drawing a character; it's merely dependent on what I'm able to do at the moment I sketch! Thank you for lending me your characters for practice! If you really like how the sketch of your character turned out, you can of course also commission me to finish it either traditionally or digitally! Prices for finishing sketches go down from my regular prices to 10$ for a portrait and 15$ for a chibi since I only do those fullbody and it takes up more of the sketchpage. It seems I can't access the linked boy - it tells me an invalid character was selected. If you don't want to put the character on public / only accessible with tokens to post the link, feel free to DM me some references so I can work with those! 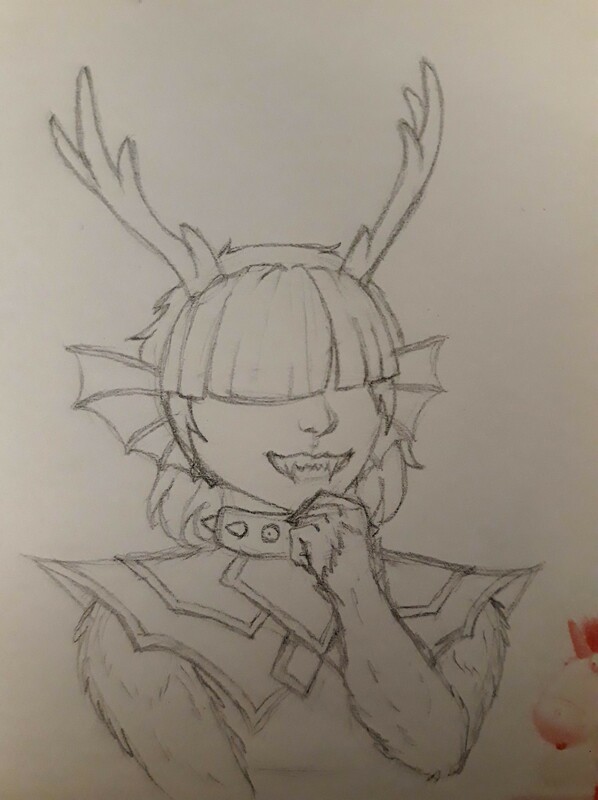 I tried to keep his bright smile up in his human form, hope you like it! If you'd be interested in this boy, I would love a chibi of him! Thank you for the chance! Feel free to look at my other characters as well! OMG CAN I ORDER AGAIN CAUSE WOW I LOVE IT!